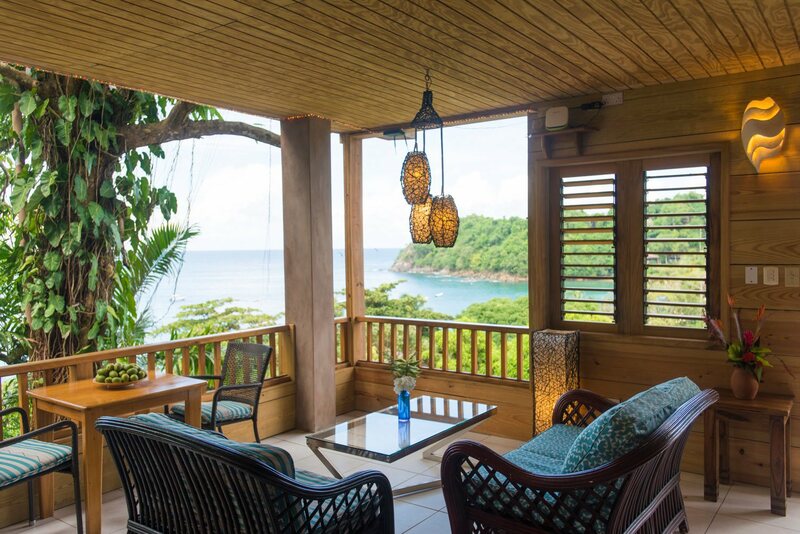 With views to the Caribbean Sea through the foliage of a fabulous mango tree, Coco Palm offers contemporary living and blends elegant interiors with natural elements. The spacious open-plan living and kitchen area leads through French doors to the large en-suite air-conditioned bedroom. Coco Palm has a small outdoor terrace with bistro table offering space for al-fresco dining, taking in the views across the village to the Bay. To the rear is a terrace, shared with Shady Mango, with sun loungers and beach chairs – perfect for bird watching or for taking a siesta in the shade of the golden apple tree above. Coco Palm is one of our apartments closest to the village. As a consequence, the sounds of Castara are more prominent than elsewhere in our gardens. While most guests are entirely happy here, if you are noise-sensitive, you may like to explore availability in another of our accommodations. The first terrace is located behind the apartment with two sun loungers and two beach chairs. It is great for dappled sunshine, shade and birdwatching. This terrace is shared with Shady Mango. For guests wanting to sunbathe, the second terrace is just a short walk away and is shared with all guests at Castara Retreats. It includes four sun loungers and two beach chairs and has views to the ocean.